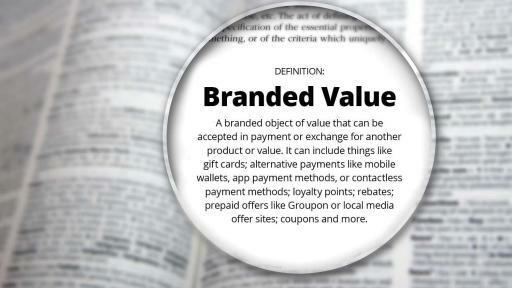 Evaluating Branded Value to Determine the Power of Brands: Does Brand Still Matter in the Digital Age? PLEASANTON, Calif. – May 2, 2017 – Technology-dependent lifestyles and consumer preferences for peer-to-peer recommendations are reshaping the ways that marketers can successfully engage with shoppers. 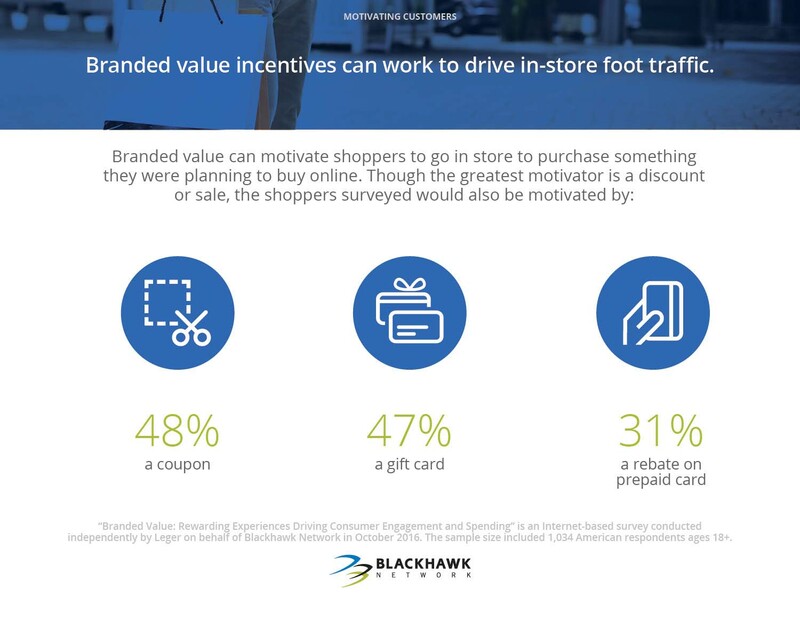 New research* from Blackhawk Network examines how branded value motivates shoppers to spend and engage with brands, thereby measuring the value of brands in today’s economy. 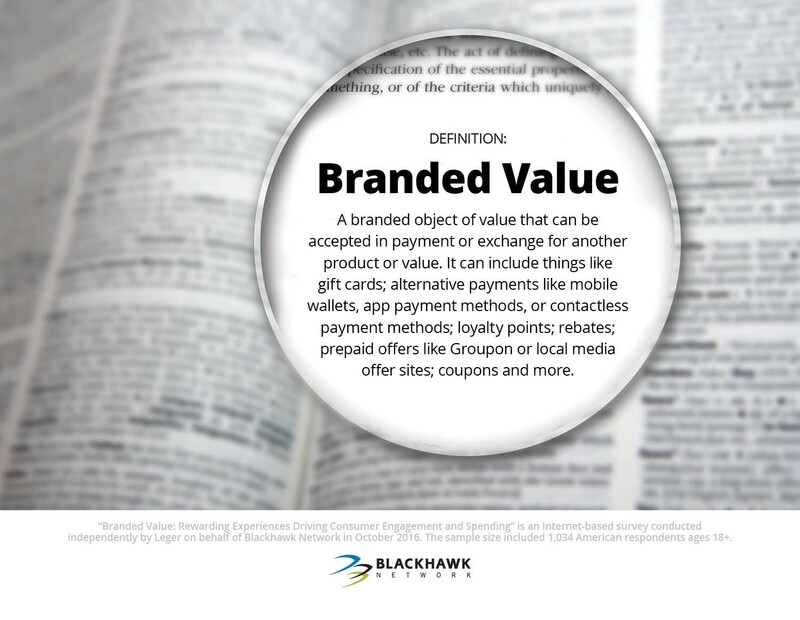 Blackhawk commissioned the independent research to study branded value—a branded object of value that can be accepted in payment or exchange for another product or value. Branded value can include things like gift cards; loyalty points; rebates; alternative payments like mobile wallets, app payment methods, and contactless payment methods; and targeted offers. Marketers have long used these tools to create rewarding experiences and build consumer engagement, and are now beginning to define and understand them as branded value. Does Brand Still Matter in the Digital Age? 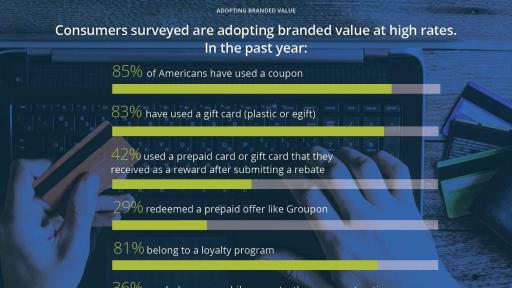 Consumers are using different forms of branded value at high rates: In the last year, 83 percent of the consumers surveyed have used a gift card (plastic or egift), 81 percent belong to a loyalty program 42 percent used a reward received after submitting a rebate, and 36 percent regularly use a mobile or contactless payment option. 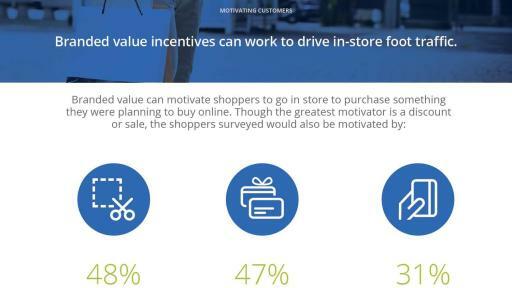 Branded value rewards can motivate consumers to convert at ecommerce checkout. 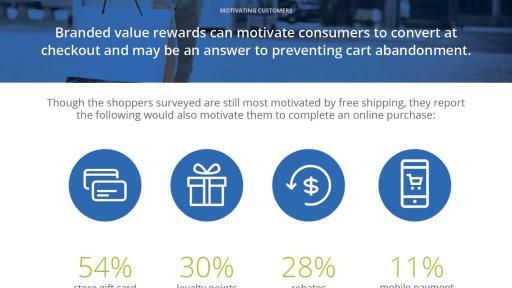 Though shoppers are still most motivated by free shipping, the shoppers surveyed reported that the following would also motivate them to complete an online purchase: a gift card to the store (54 percent), loyalty points (30 percent), rebates (28 percent) and a mobile payment option (11 percent). Seventy-two percent of the offer users surveyed say targeted offers would prompt them to visit a store or website they wouldn’t have gone to otherwise. 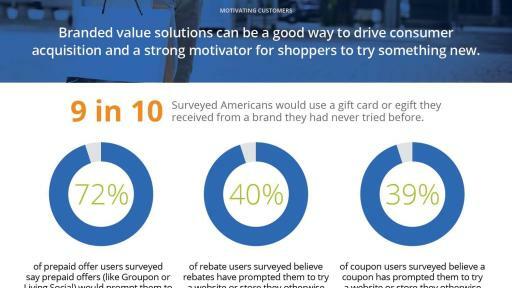 Forty percent of the rebate users surveyed believe rebates have prompted them to try a website or store they otherwise wouldn’t have tried. 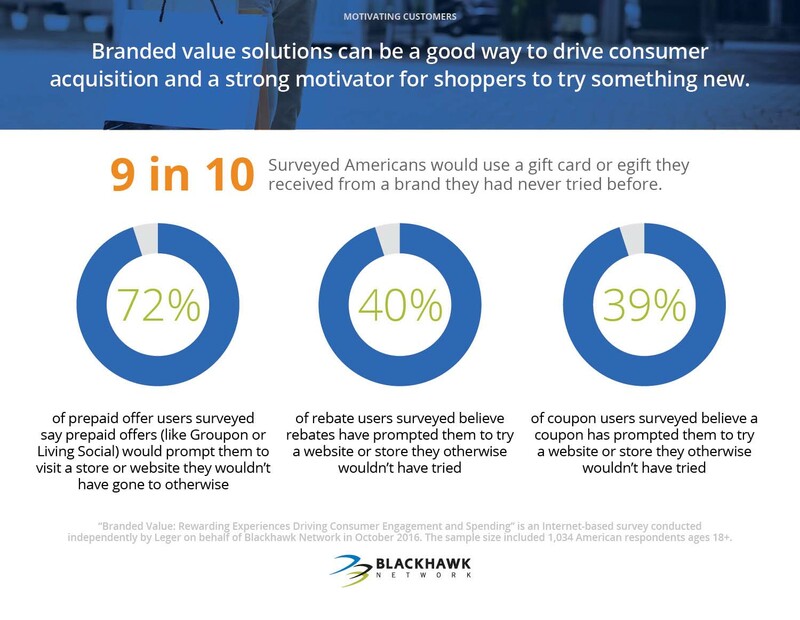 Thirty-nine percent of the coupon users surveyed believe a coupon has prompted them to try a website or store they otherwise wouldn’t have tried. Thirty-five percent of the alternative payment users surveyed indicate that an alternative payment option has prompted them to try a website or store they otherwise wouldn’t have tried. Of the surveyed gift card users: 95 percent are satisfied and 70 percent very satisfied when receiving a gift card. The consumers surveyed report spending, on average, $27 over-and-above the original value of the gift card. Of the surveyed egift users: 93 percent are satisfied and 64 percent very satisfied when receiving an egift. They spend, on average, $29 over-and-above the original value of the egift. Of the surveyed rebate users: Eighty-two percent would likely recommend a retailer offering a rebate, and 83 percent report that a retailer offering a rebate makes it more likely that they’ll end up making a purchase. Of the surveyed alternative payment users: Mobile payment options make 26 percent feel more loyal to the brand/retailer in question. Seventy-seven percent would likely recommend a retailer offering a form of alternative payment (like a mobile wallet) and 78 percent also believe that a retailer offering a form of alternative payment ups the likelihood of them making a purchase. Of the surveyed loyalty program users: Over a third (36 percent) feel more loyal to a brand/retailer after redeeming loyalty points from it. Eighty-five percent would likely recommend a retailer offering loyalty points. Eighty-nine percent also report that a retailer offering loyalty points increases the likelihood of them making a purchase. 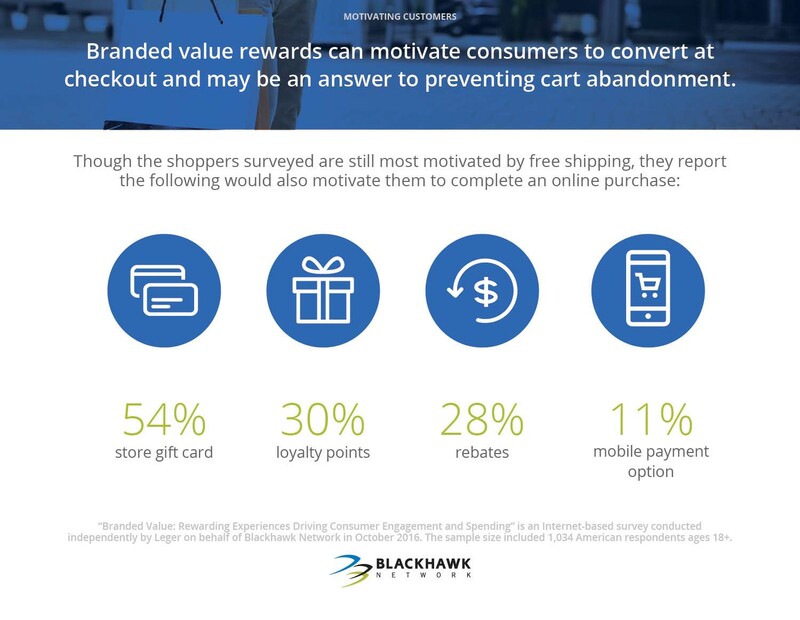 To download the complete “Branded Value: Rewarding Experiences Driving Consumer Engagement and Spending” ebook, visit: https://blackhawknetwork.com/branded-value/. 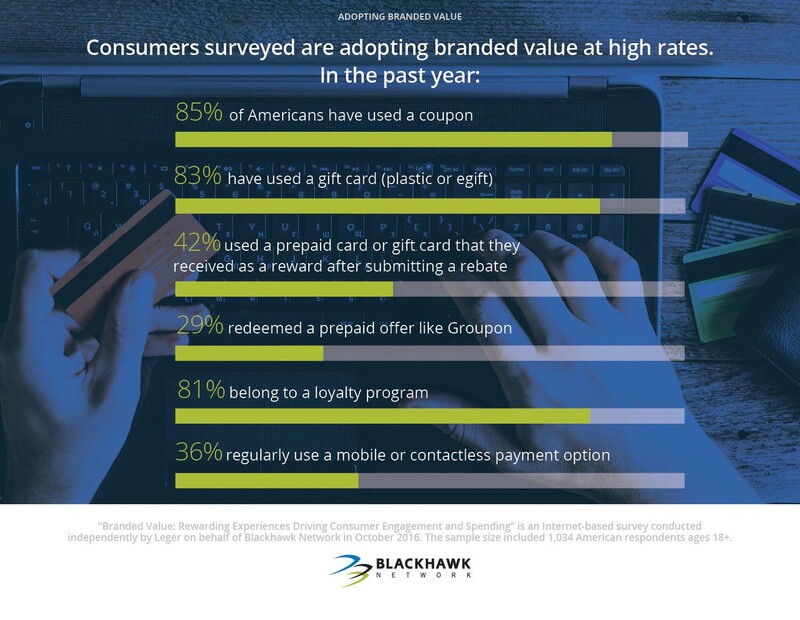 “Branded Value: Rewarding Experiences Driving Consumer Engagement and Spending” is an Internet-based survey conducted independently by Leger on behalf of Blackhawk Network in October 2016. The sample size included 1,034 American respondents ages 18+. Blackhawk Network Holdings, Inc. (NASDAQ: HAWK) is a leading global stored value and payments provider, which supports the program management and distribution of gift cards, telecom products, and financial services products in retail, digital and incentive channels. Blackhawk’s digital platform enables the management of stored value products, promotions, and loyalty programs across a network of digital distribution partners including retailers, financial service providers, and mobile wallets. For more information, please visit www.blackhawknetwork.com or product websites Cardpool, Gift Card Lab, Gift Card Mall, GiftCards.com and OmniCard.